The usual reason for this kind of process is to enable a better hiring decision incorporating the perspectives of different functions within the organization, such as the hiring manager, HR, a senior manager or your prospective teammates. You also have an opportunity to demonstrate your ability to communicate and build rapport cross-functionally. To get a head start on that, find out the individuals’ names and roles beforehand and look them up online to find clues to their interests and personalities. If you’re unable to do this, be sure you ask for business cards when you are introduced. You’ll need that information in order to send a thank-you note to each interviewer. Being interviewed by an array of people can feel stiff, unnatural or intimidating, and can be stressful. Intentionally or not, this discomfort functions as a test of your ability to perform under pressure. Remember, the interviewers probably feel uncomfortable too. Think of them as individuals, and do whatever you can to connect and put them at ease–smiling, nodding, using appropriate humor. This will make you feel more at ease yourself. After asking for permission to take notes, jot down their names, arranged visually to correspond to their physical locations at the table. This will help you address each person by name and build rapport. 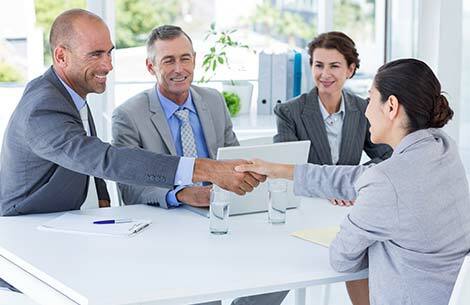 The interviewers may each ask questions relating to their own interests, in which case you should address your answer primarily to the person asking, while making friendly eye contact with the others to help keep them engaged. Or the group may have a shared list of questions and take turns asking. In this case, address your answer to everyone, not just the one who spoke. At some point, usually toward the end, you will probably be asked what questions you have for the panel. In advance, prepare a question for each person, appropriate to their role. For example, you might ask the HR person to describe the company culture or ask a prospective peer what their typical day is like. Make sure you have good-sized list of accomplishment stories to tell, because it’s best not to repeat all the same ones with every interviewer. They will probably compare notes, and you don’t want them to get them the impression you have only a few accomplishments. On the other hand, your very best wins are probably worth repeating. Tailor your presentation to the interests of the specific person: the CEO may be interested in your contributions to the bottom line, while your prospective teammates may care more about your personality and collaborative skills.